Radio-loud AGN are routinely invoked as sources of 'AGN feedback' in cosmological models, but in order to understand their detailed effect on their environments we need realistic high-resolution simulations of their evolution, with parameters matched as closely as possible to what is actually observed. In addition, such simulations can give us uniquely good information about the evolution of the radio properties of these sources (length, radio luminosity, radio spectrum) with time. We have been carrying out a suite of simulations with increasingly good (i.e. physically realistic) modelling of both the cluster environments and the host galaxies themselves: in our latest work we include relativistic jet speeds, realistic (i.e. ultra-light) jet densities and accurate (observation-matching) magnetic field strengths. 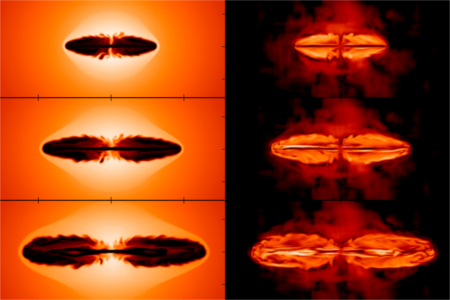 Evolution of the density (left) and magnetic field energy density (right) in an MHD simulation of a radio galaxy in a magnetized cluster environment.